The United Nations Capital Development Fund (UNCDF) is a partner in the UNDP Development group. UNCDF works to reduce poverty in least Developed Communities worldwide through a variety of innovative approaches in both local governance and micro finance initiatives. In achieving this goal, ten(10) strategic locations were selected resulting to our need for representatives (agents) in these locating. Without sentiment a random selection was made to appoint our representatives which classifies you as an authorised agent of UNCDF based on the selection. Since its creation, UNCDF has been dedicated to searching for the right tools to assist local authorities to increase their efficiency and find sustainable solutions to face their challenges� decentralization, local development, services provision to their local populations and the strengthening of local democratic life. The issues relating to managing, operating, and financing local authorities, the delivery of local services, and the development of local economies are difficult. They are complex issues that involve a great many actors: citizens, selected authorities and governments as well as development partners. As a representative (Agent) you assist in developing effective processes for the coordination, monitoring and evaluation of all projects and programmes related to the national programme of Decentralised Planning and Financing. You will liaise with Donors and NGO's which we will provide in supporting and monitoring pilot programmes geared towards improving Development method. formulate comprehensive action plans to secure local livelihoods & improve decentralized management of natural resources. Supporting central governments to formulate policies promoting administrative, political and fiscal decentralization, to foster enabling legal and administrative environments, and to strengthen local economic development. Empowering the organizations of local civil society, particularly women's associations. This will be done in your country by your help with the funds we will provide. *This appointment will not interfere with your job. 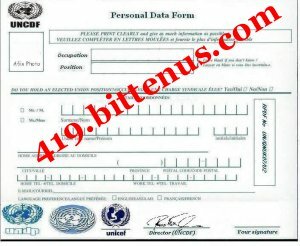 1) As an agent of UNCDF you will be entitled to a starting remuneration of Sixty thousand Pounds Sterling ( 6 0,000.00 GBP) per annum in addition to other benefits which will be made known to you. 3) You will be granted security in any circumstance. Note: Indicate your acceptance of this offer by filling out the form in the attached file for approval and return. We congratulate you on your selection to the service of the UNCDF. UNCDF was contacted, and they confirmed that this is a scam.